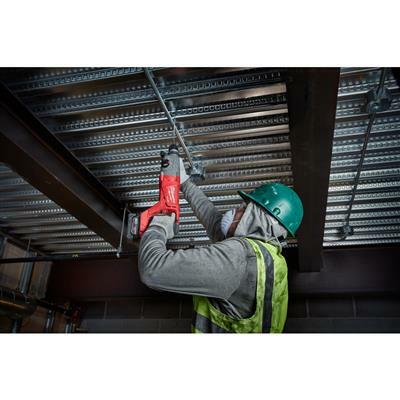 Powered by FUEL technology, the M18 FUEL 1" SDS Plus D-Handle Rotary Hammer delivers faster than corded speed, corded durability and all day work on one charge. The Milwaukee POWERSTATE™ Brushless Motor Provides 2.1 ft-lbs. of impact energy, 0-1,500 RPM and 0-4,400 BPM. 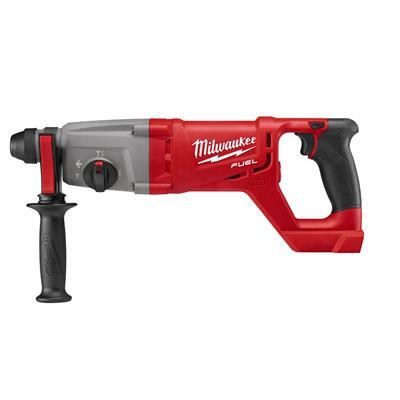 The Milwaukee REDLITHIUM XC 5.0 Battery Packs (not included) provide all day work on one charge, 20% more power and 2X more recharges than standard Lithium-Ion batteries. REDLINK PLUS Intelligence integrates full-circle communication between tool, battery and charger to protect from overloading, overheating and over-discharging. REDLINK PLUS Intelligence: Integrates full-circle communication between the tool, battery and charger to protect from overloading, overheating and over-discharging. Mechanical Clutch: Prevents the motor if bit binds. Variable Position Chisel Stop: Allows Steel to be adjusted, regardless of orientation. LED Light: Illuminates dark workplaces. Thin Wall Core Bit Capacity	 2-1/2"